While most kids would feel anything but excited to see a school bus in July, Luckerly Gabriel could not wait to step on board. That is because this bus was headed to the Hole in the Wall Gang Camp, a specialized camp for youth with cancer and serious blood diseases. For Luckerly, he had been eager to go to camp for the past two years, and this summer he was finally healthy enough to do so. As a 10-year-old with sickle cell disease (SCD)—a chronic, genetic blood disorder which causes painful attacks and fatigue that can be especially difficult for kids—it had been a long time coming. 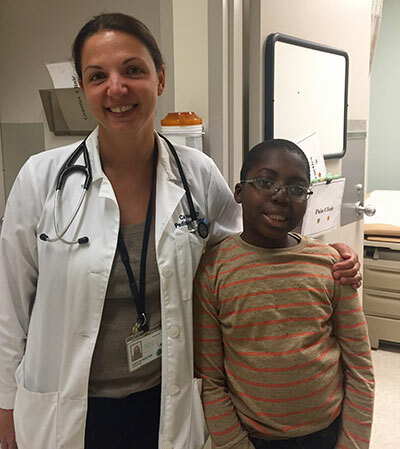 Caitlin Neri, MD, pediatric hematologist and oncologist and medical director of the Pediatric Pain Clinic, is part of Luckerly’s team of caregivers who implemented a treatment plan to better control his disease and prevent future hospitalizations. “We were able to help Luckerly by starting him on hydroxyurea, an excellent medication for sickle cell disease, which was not available in Haiti,” says Neri. “This has reduced the frequency of his pain episodes.” In addition to prescribing medication to help his condition, Luckerly’s team of providers helped him and his family adjust to life in a new country as best as possible. “We helped the family navigate the challenges of starting out in a new country, with lots of help from our pediatric hematology social worker, family navigator, Health Leads and other programs here at BMC,” adds Neri. Two years into his care at BMC, Luckerly’s health has significantly improved and he experiences far fewer pain episodes, with severe episodes occurring about once per year. His team of providers continue to focus on a multidisciplinary approach to treating his SCD, which includes visits to the Pediatric Pain Clinic. “In Pain Clinic, Luckerly has access to both medical and non-medical therapies to manage pain,” explains Neri. “He has tried aromatherapy, acupressure and is learning mind-body strategies to help him cope with pain.” With Luckerly’s disease better controlled, BMC made sure he could experience activities that all 10-year-olds should, including summer camp. His caretakers coordinated all of the appropriate paperwork for his mom and before he knew it, he was on his way to a week of summer fun at the Hole in the Wall Gang Camp, along with 33 other children with SCD. “The week was specifically devoted to kids with SCD, and is instrumental in normalizing the disease for young patients, eliminating the barriers that frequently keep them from engaging in ‘normal’ kid activities and modeling proactive and effective disease management,” explains Child Life Specialist Ashley McClellan, CCLS. Luckerly returned from camp happier than ever, and could not wait to share his experiences with his mom. “He told me everything about camp, made friends and had a great time with them,” his mom recalls.